Breathe easier on cold days. Cold weather mask takes away the risk of breathing outdoors in the winter by warming the air you inhale. Fleecy exterior has polyester lining and stretchy ear straps. Machine wash. Imported. My husband has C.O.P.D and cold weather greatly affects his breathing. He will be able to keep his oxygen on and wear his mask when outside. Many thanks for this. BTW, our neighbor saw his mask and wanted one for when she is shoveling snow(her husband had a stroke and is partialy parilized) so she will receive one for Christmas! I purchased 3 of these for myself, daughter & grandaughter. We are all asthmatic, and have difficulty walking outdoors if it's cold and windy. Especially windy, haven't tested them yet, but it's for Christmas gifts unless there is a major winter storm before then. I will continue buying this product. Being a senior citizen I use the mask when it's cold. When I get the mail or have to go any where when it's cold. It's very useful because I have asthma and bad allergies year round. was given as a gift and just in time . He wears it to work. I'm so glad I found this mask. I have breathing problems to start with and the bitter cold just makes it's next to impossible to be able to go out in cold weather. But this mask is wonderful for people who have trouble being out in the cold. You won't be sorry. I will buy again and again! I have Asthma, and it helps keep the cold out of my lungs. Works Great. I use this product when I open the door to the wood furnace to attend to the fire. Now, I don't breath in the smoke from the fire. Having COPD, the Cold Weather Mask is essential for not breathing in smoke and or freezing temperatures. I will be purchasing again when needed. I highly recommend the Cold Weather Mask for anyone who doesn't want to breath in smoke and/or cold temps. Daughter uses this product for years, because of Asthma. She uses this for pollen in the spring and when the weather is cold or windy. It works for us. Serves practical purpose and easy to use and maintain. This is the first that we ordered anything like this. My husband had triple heart bypass surgery so we don't know how well it will work when he has to plow snow from the driveway. It looks a lot better than those white paper masks you can buy. Time will tell, wish us good luck. Though it hasn't been cold enough yet to use it, I'm hoping this will do the job! After having two lung surgeries, Anything to stop cold air flooding them will be a help! I have asthma that is aggravated by cold air so bought this mask to warm the air I breath. It fits well and will work fine. It is supposed to be hand washed and air dried - would prefer machine washable and dryable product instead. This is no good if you wear glasses! 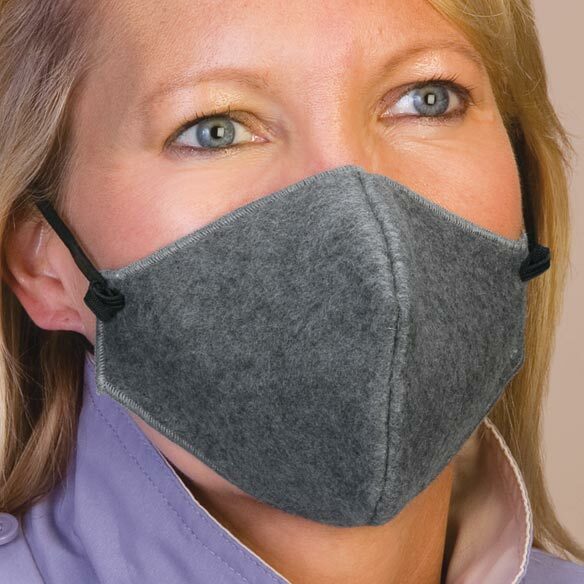 I bought this because I have COPD and need something over my mouth and nose when I go out in the cold air. I love that it is nice and warm so am breathing warm air rather than cold. however, it does not fit tight around the nose so if you wear glasses they will steam over greatly! I purchased this weather mask as I have COPD and when it is cold outside I have hard time breathing in the cold air. I received the mask as ordered, but it is way too small for my face. It barely covers my nose and mouth, and it slips off easily due to it's small size. The statement should have one size fits most.The mask did not fit properly over my face. I am an over weight person and the mask did not fit it was not wide enough. Does not fit properly. Cannot keep the elastic ear straps attached to the mask and when you knot it I find it bends and hurts the ears. Also noted it tends to hold moisture on the inside of the mask. THOUGHT IT WOULD HELP FOR THIS WINTER TO BREATH IN COLD WEATHER BUT DOES NOT EVEN FIT AS IF IT WAS MADE FOR CHILDREN - WILL DONATE IT BECAUSE NOT WORTH THE MONEY FOR POSTAGE TO RETURN IT. I tried mask at about 30 degrees & breezy. I couldn't get it snug to my face, so air came in around it. Definitely would not be satisfactory for me in extreme cold. Might be hard to breathe through it if it were tight. I went back to using my scarf! for my husband who has a problem. Need this for the winter time. My mom needs it to wear in cold weather she has breathing problems. I have issues breathing in the cold air from either air conditioning or weather. I have COPD and need this for the cold weather. My Grandmother has trouble breathing in cold air. I hope this will help her. I read the reviews and they were all positive. No Cons at all! Have COPD, cold wind takes my breath away. Having COPD the cold air and wind make it very difficult to breath. Have respiratory problems when air is col. I have COPD and cold air makes breathing difficult. I purchased this hoping it will enable me to breath easier when out in the cold air. In winter cold air hurts my lungs and scarfs slip down. had 2 lobes removed from rt lung and have emphysema. Am working little by little to extend my time outdoors in winter. at 10 degrees and lower I still have problem. My teeth are very sensitive to the cold air. Hoping this helps. Ringing in ears. Hope this oil helps also. to protect my lungs from cold weather and it's simple. I need a mask so I can go out in the cold. I have major respiratory problems. Hopefully this will work. looking for cold weather protection when walking my dog. My wife's nose is always cold. This is an attempt to solve this problem. Thank You! It looked interesting; and if helps during the winter months that would be good. Looked like a good weather Mask. Have asthma, and cold air triggers an attack. Parents need protection during the winter as the are prone to bronchitis. I need to know about cancer causing agents in the mask? BEST ANSWER: Thank you for your question. No documentation is given or stated that there are cancer causing materials. The Cold Weather Mask is made of 100% polyester. We hope this information will be of help to you. does it cause cancer causing agents? BEST ANSWER: Thank you for your question. No documentation is given or stated that there are warning for cancer causing materials. The Cold Weather Mask is made of 100% polyester. We hope this information will be of help to you. How many times can a person use this before it is washed? BEST ANSWER: Thank you for your question. That would determine on how often you use it and for how long you use it. It is going to vary from person to person. We hope this information will be of help to you. Will it keep out second hand cigarette smoke? BEST ANSWER: I really can't answer this question since I was not around or near anyone who smoked while I was wearing it. Sorry I could not be of more help. Thank you for your question. The mask does not block out smoke. We hope this information will be of help to you. What type of material is the strap made of ? BEST ANSWER: The strap is made of regular elastic. Hasn’t been worn yet other than trying it on. Felt comfortable.